Maker Faire, that two-day celebration of all things DIY, is coming to the San Francisco Bay Area this weekend. Want to learn more about homebuilt spacecraft, high-voltage artwork, wearable technology, or the intersection of crafts and science? Maker Faire is for you! Here's a round-up of some of our favorite projects that'll be at the Faire in San Mateo, CA this weekend. This is Mark Perez's 50,000-pound rendition of a favorite childhood game. 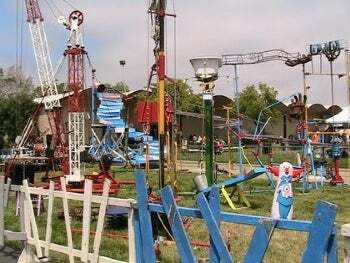 This kinetic sculpture/Rube Goldberg device also features a original musical score, can-can dancers, clowns, acrobatics, and even more spread over an area of 6,500 square feet. It's quite the spectacle! 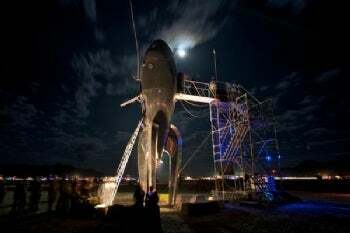 Standing 40 feet tall, the Raygun Gothic Rocketship is styled to look like a (literal) blast from the past. With three decks of retro-styled displays and alien lifeforms, this rocket, created by Sean Orlando, Nathaniel Taylor, and David Shulman, is based on the "future-rustic vision of yesterday’s tomorrow". Be sure to check out the Uira Plasma-drive engine! While we're on the topic of space, don't forget to check out a talk by Keith Cowling of NASA Watch on some classic kludges, repairs, and hacks made by NASA, including lunar rover repairs and fixing Skylab with boating tools purchased a local marina. Keith's presentation will be on Sunday at 11 am on the center stage. Interested in creating your own 3D content for that spiffy new 3D TV you picked up? Stop by Fiesta Hall to see exhibits on a variety of homebrew 3D imaging techniques, including moving phantograms and some DIY 3D photography workshops. 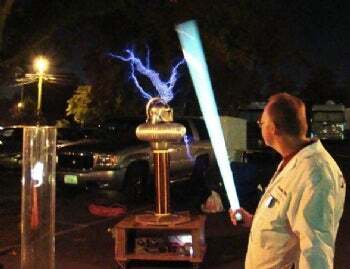 Talking Tesla coils, Van de Graaf generators, and high voltage, oh my! Learn about physics and see some awesome wireless demonstrations of electricity. Kitty Twitty is a cat toy that tweets whenever your cat plays with it. Built with an Arduino and only a few lines of code, the Kitty Twitty offers reassurance to cat owners everywhere that their pets are happy while their humans are elsewhere. Just don't let the cat develop a habit of chewing on the cord. For more information, check out the MakerFaire Website. If there's something that you're really looking forward to seeing at the Faire (see the schedule), let us know in the comments. Happy hacking!